Team Ironwood, Francorchamps SPA, Belgium– It is midnight and my roommates are fast asleep, snoring soundly away, we are in Airolo, Switzerland. It’s been a whirlwind of activity in the week since we landed in Europe , and the first chance I’ve had to recap what took place this weekend. 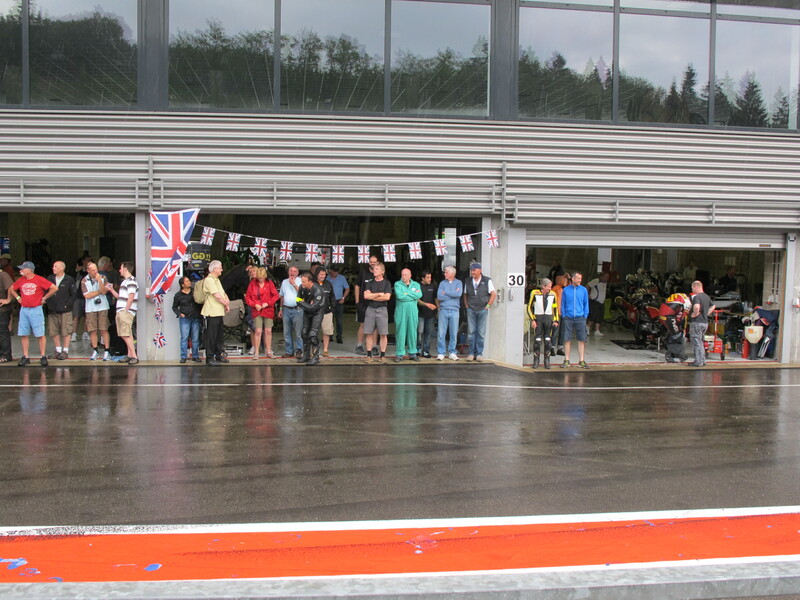 We came for the 10th annual Bikers Classic 4-Hour Endurance Race at the amazing 4.4 mile Francorchamps SPA race track in Belgium. A popular and demanding classic endurance motorcycle race in Europe taking place usually late June/early July. This Formula One race track is incredibly fast, 19 turns, consisting of several esses and one hairpin, not to mention elevation changes and an incredible view. 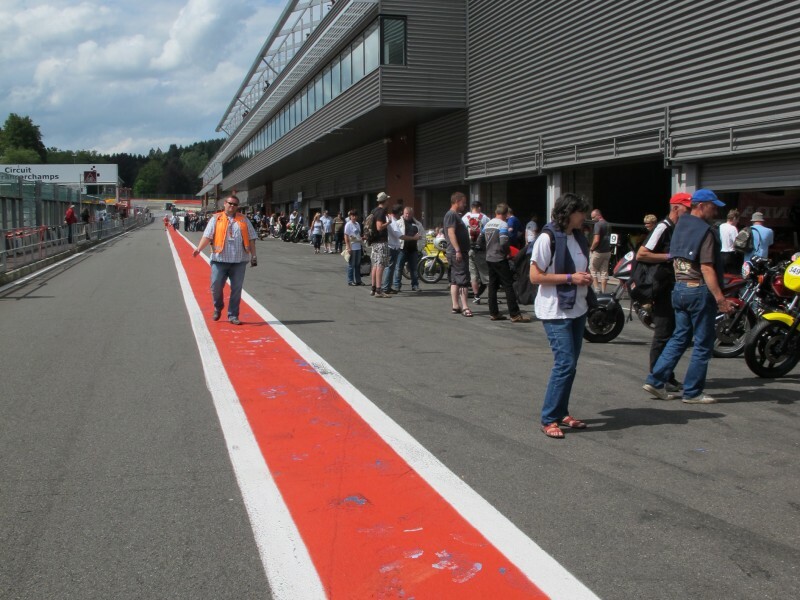 It winds through the very wooded Ardennes forest and lies next to the Eau Rouge river. Fast moving weather happens here, with rain typical, leaving the track wet, causing a low lying fog that hovers inches above the the track, at night. 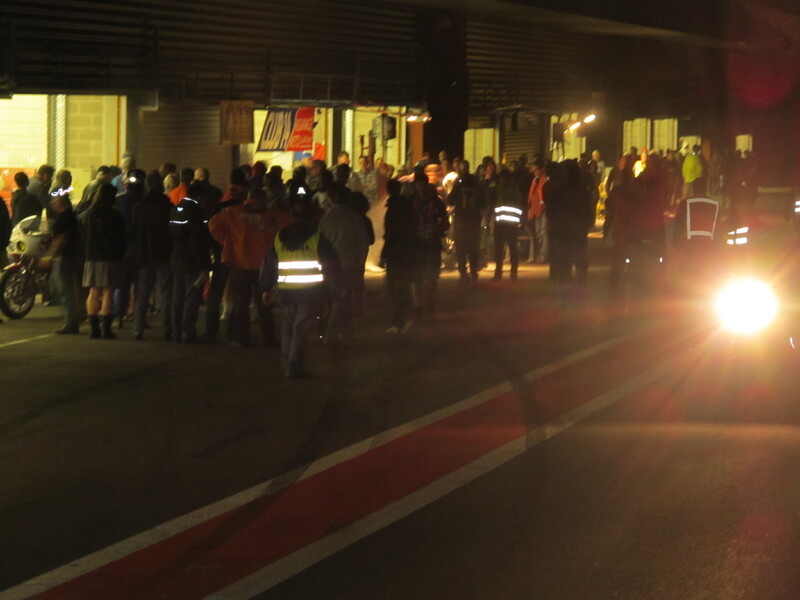 Half of the four hour race is at night and can be unforgiving. Luckily for us the sun remains out and pre-race activities made for a really busy weekend. Racers of All Types – We arrive mid-week, renting a box truck to pick up the race bikes which were crated and flown over from California the week prior. Custom delays made for some frustration, but once track side Thursday night things went easier. 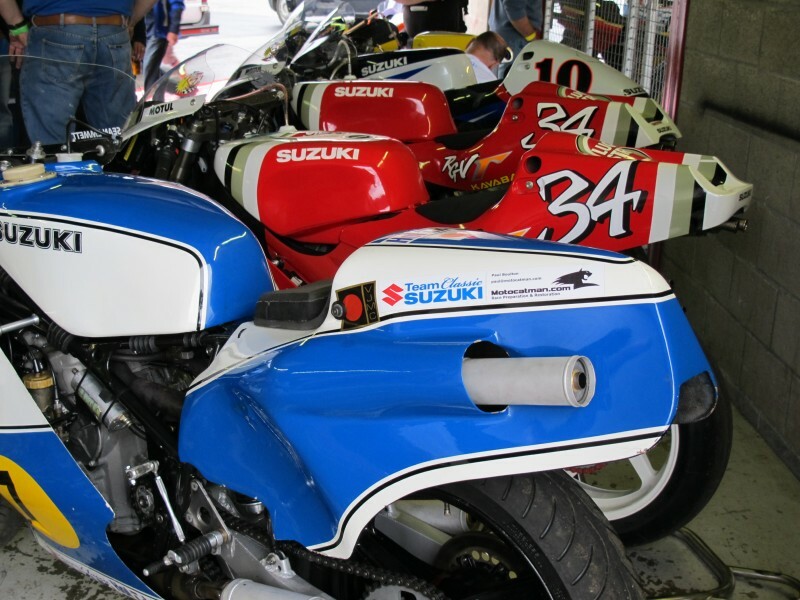 In addition to the Bikers Classic 4-Hour Race, there is also the Classic Super Bike Races which take place the same weekend. 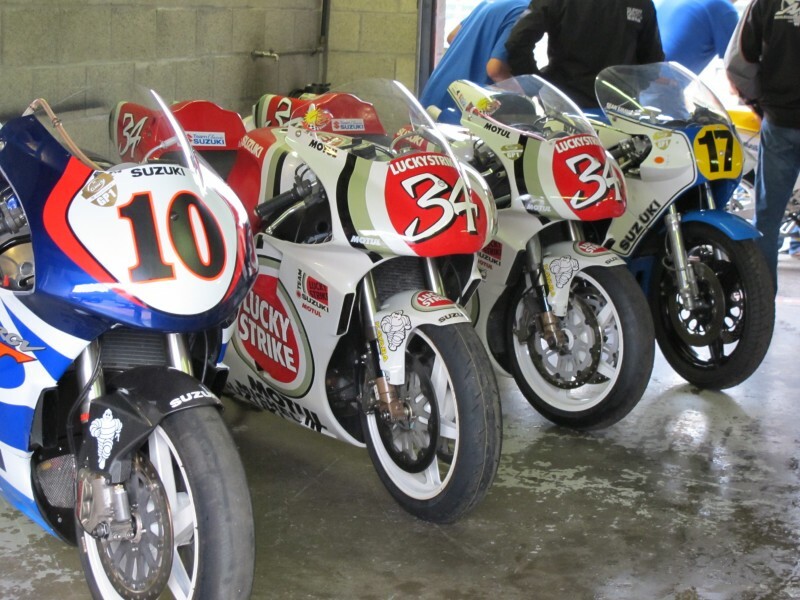 Veteran racers Freddie Spencer, Doug Polen, Mick Grant and Phil Read were just a few of the racing greats attending this year. 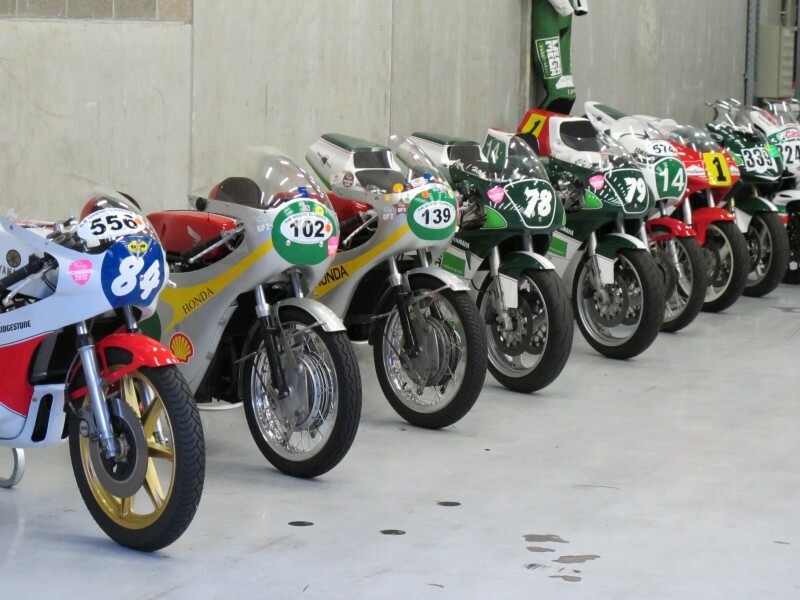 But the real attraction besides vintage GP bikes, are the 80 hopeful classic endurance race teams coming from all over, only 70 will be allowed on the starting grid. 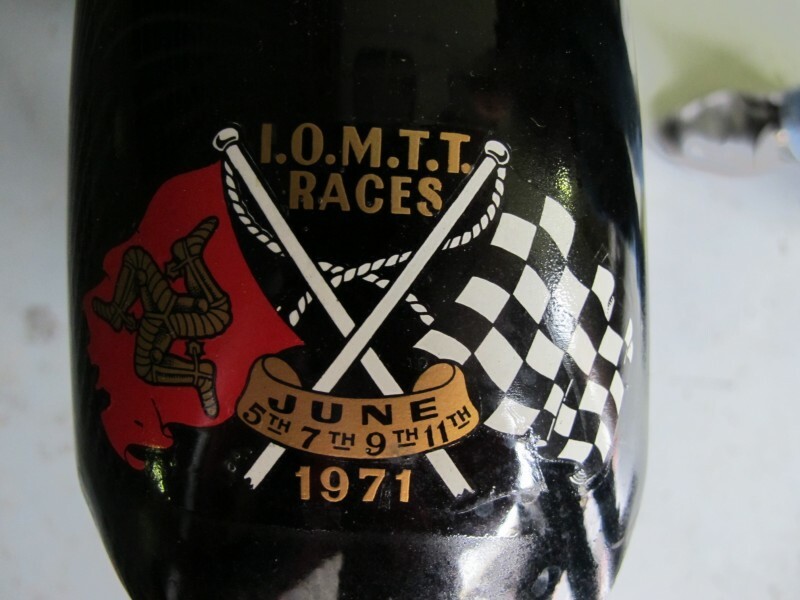 We are hoping to be one of them, qualifying is Friday, June 29th, racing the next day. Ready to Go – I came to the Bikers Classic 4-Hour event last year to support one of two American teams. 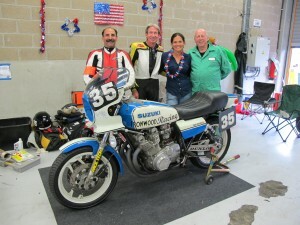 The first Americans to participate ever in the event, Team Ironwood and Guzzi Nerd. Team Ironwood includes two very experienced veteran AMA racers Ralph Hudson (CA) and Gary DiPietro (NY), Chris Mee, and myself. 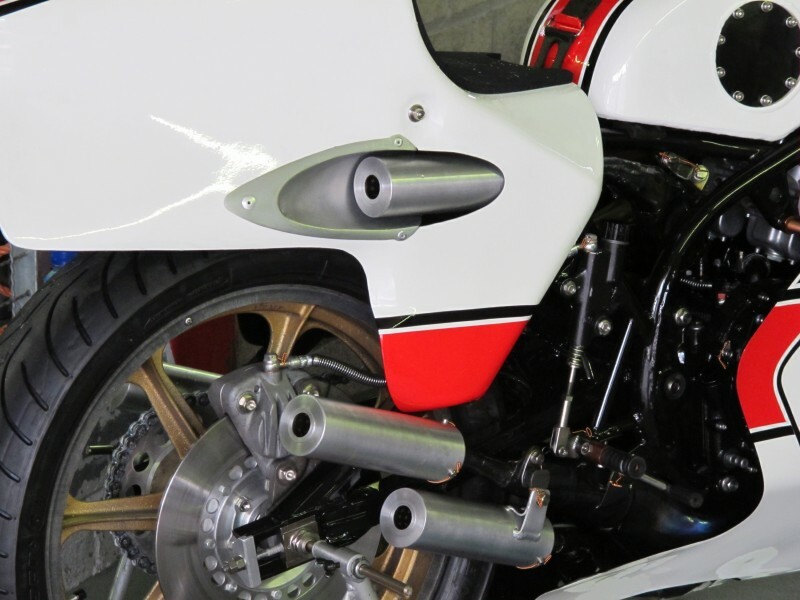 The weapon, a 1980 “Wes Cooley” Suzuki GS 1000 prepared by Ralph. This same bike raced last year with a bit of bad luck, 90 minutes into the race, a broken clutch basket pierced the case…game over. This time with lessons learned, a proper race clutch was installed, better lighting with two PIAA lamps, and a LED number plate. 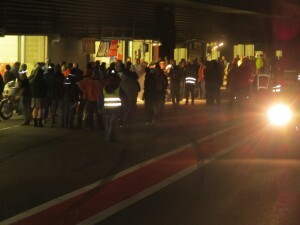 There are no lights on the track other than the ones on your bike, an important part as half of the race is in the dark. Pressure was on for Team Ironwood – This year there are two other American teams competing…well almost American. 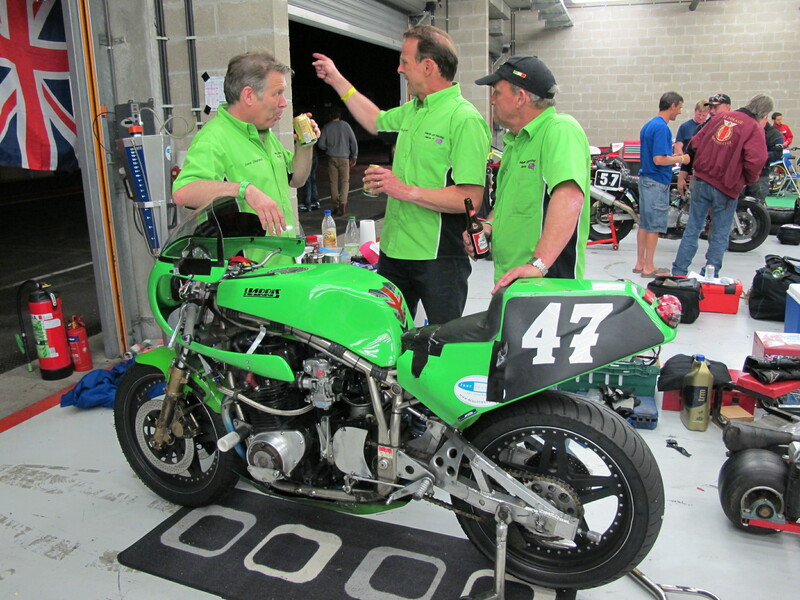 With two ex-pat Brits participating on each team, Team Guzzi Nerd, (Andrew Grey/Rick Riddick) and Team Mojo Kawasaki (Dave Crussell/Jeff L(?). 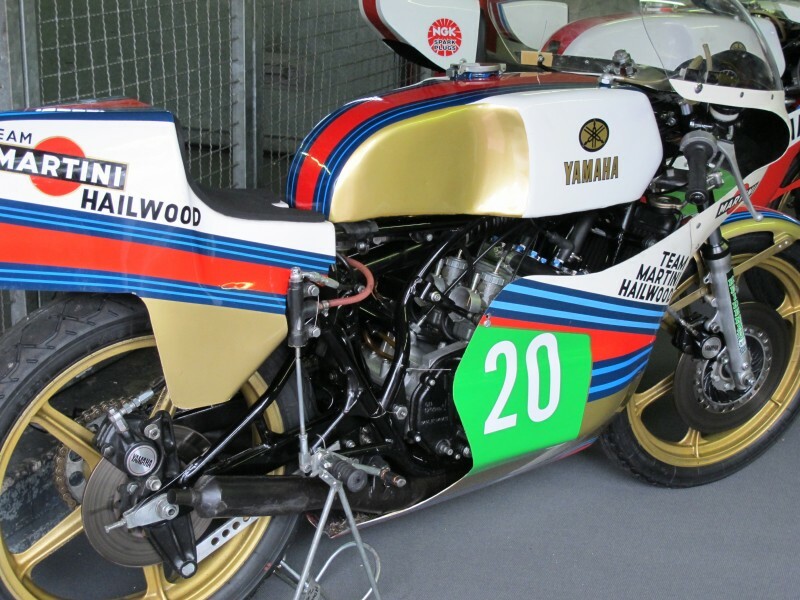 Most of them I knew from the American Historic Racing Motorcycle Association, or “AHRMA”. 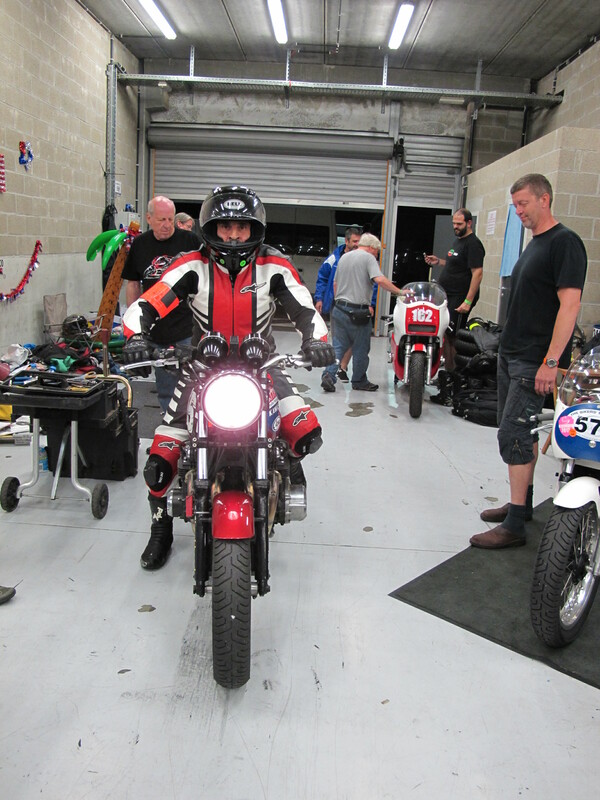 Classic bike race preparation and competition in Europe is leagues above the U.S, taking the classic motorcycle racing sport very seriously. Team Guzzi had done very well here last year, placing 18th and the fastest Moto Guzzi. Team Mojo was competing for the first time. 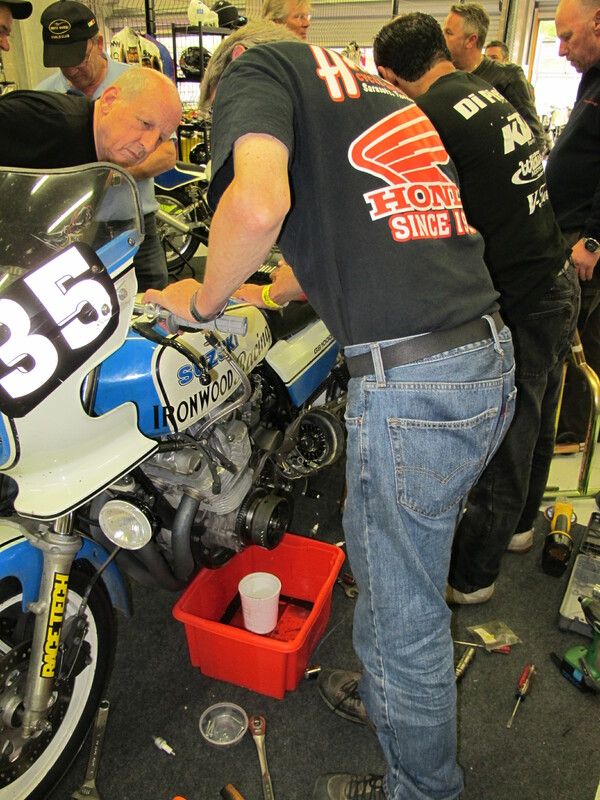 As usual there was quite a bit of last minute preparations going on for all the teams, and the garages were buzzing with mechanics, riders, crew members all setting up for practice. Team Ironwood was ready and practice began. Gary DiPietro in a Rossi-Prayer Squat – Practice commenced on Friday as did qualifying, unfortunately typical for SPA, it was wet. This endurance race requires that both riders must qualify in both a daylight and evening session. 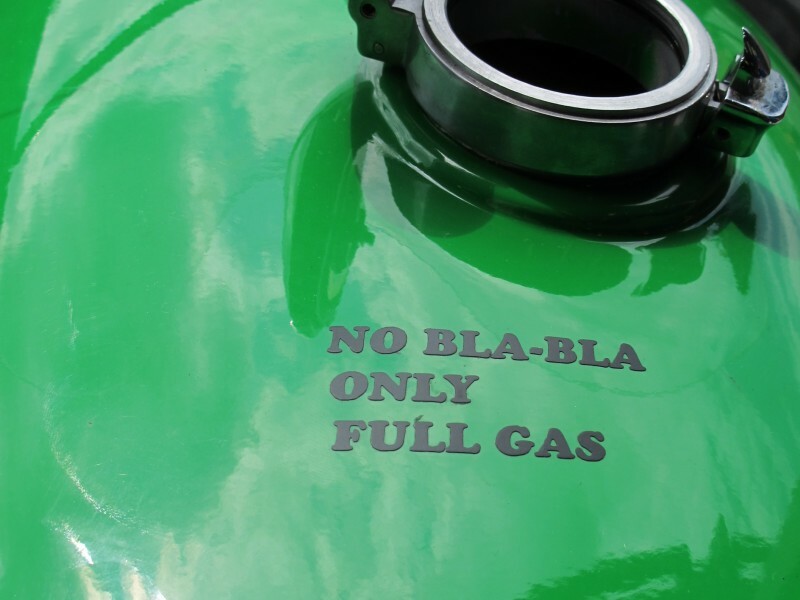 All bikes must be at least 30 years old, manufactured in 1981 or earlier, modified only with period correct equipment, and engines greater than 350cc, no singles allowed. 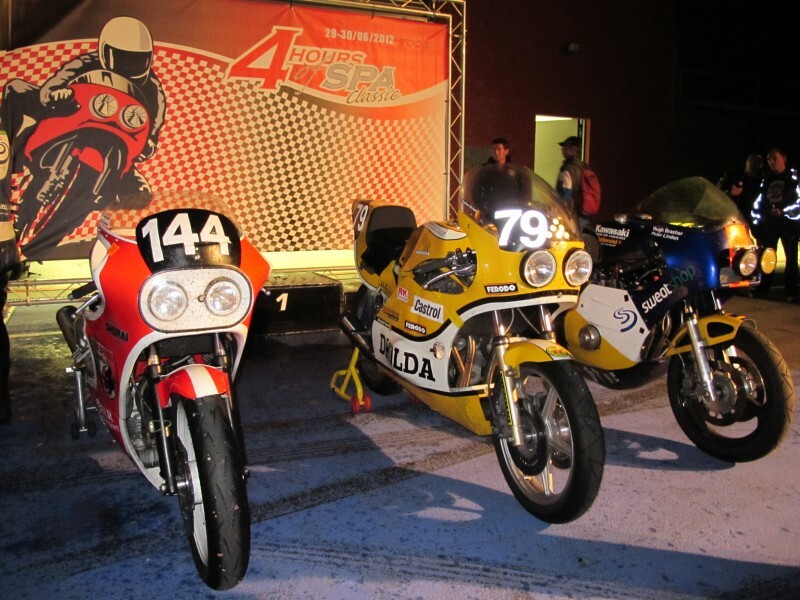 Both riders must compete in the four hour race that starts on Saturday at 8:30pm and ends four hours later, 12:30am on Sunday. 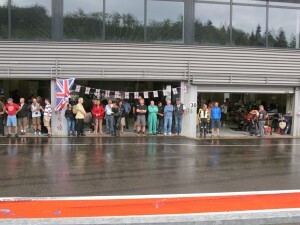 Many of the teams are veteran European Bikers Classic endurance racers and very familiar with SPA. 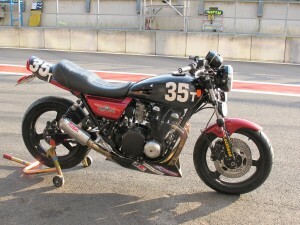 Some lap times are as low as 2:46, which is incredible for 30+ year old bikes. The real tests are not only the rider’s skills and consistency, but the mechanical skills of the builder and the ability of the crew to get the bikes back out on the track quickly after a rider change and fueling. Pit stops must be quick, smooth, synchronized skillful moves. If all goes well, there will be no dreaded “fix” required during the race as all issues were sorted prior to arrival. This race can be lost in the “box”, a term used for the “garage”…time is everything. What to Do? 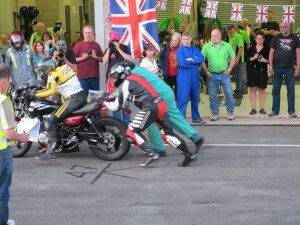 – I was to be Team Ironwood’s timekeeper once again, not an easy feat manually timing motorcycles at night. No longer relying on an iPhone for timing, I went with a real race timing setup, a Longacre dual-timer board. I just had to master using them before the race. The daytime practice went well for awhile. During the last round of daylight qualifications, which was on a wet track, Gary pulled in describing a strange sound after he had done a little off-road“dirt tracking” excursion. The bike died and would not restart. After great efforts and assistance from many, for the motto here in all the garages is “You must race!” It was determined that the cam chain jumped a tooth forward causing the valves to “kiss” and were now bent. This was a problem, as the night qualifications were about to begin in one hour, this was more than a one hour fix, and that’s if parts could be found. 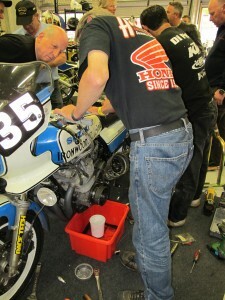 Plan B… find a spare bike so they could attempt to qualify and then tend to our Suzuki. 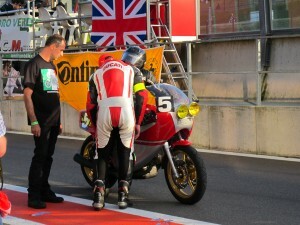 Borrowed Bike to Qualify! – Well as luck would have it, while describing the situation to Team Guzzi Nerd, a Dutch woman overheard our plight, and said she might have a bike to lend, she went to ask her husband. 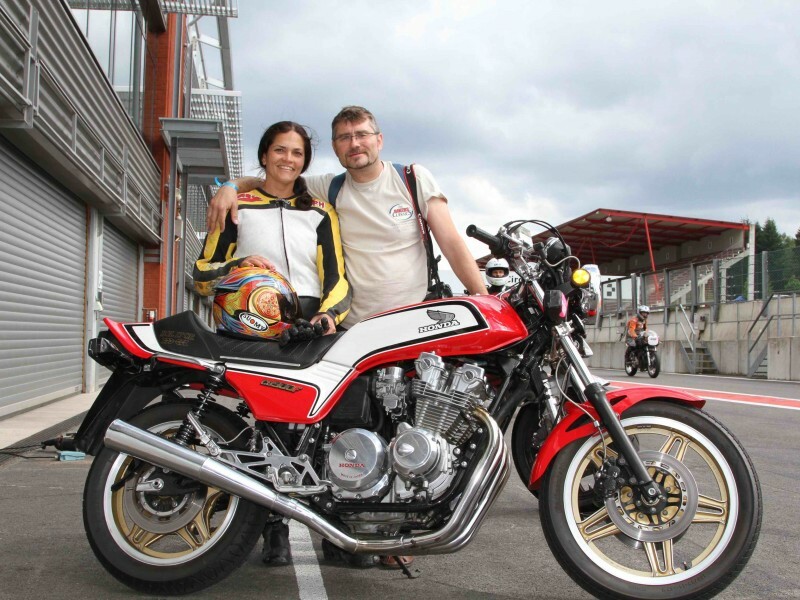 Her husband was racing in the afternoon Superbike races and had brought along his street bike, a ’79 Kawasaki Z1s, he named “Sandra” after his wife. 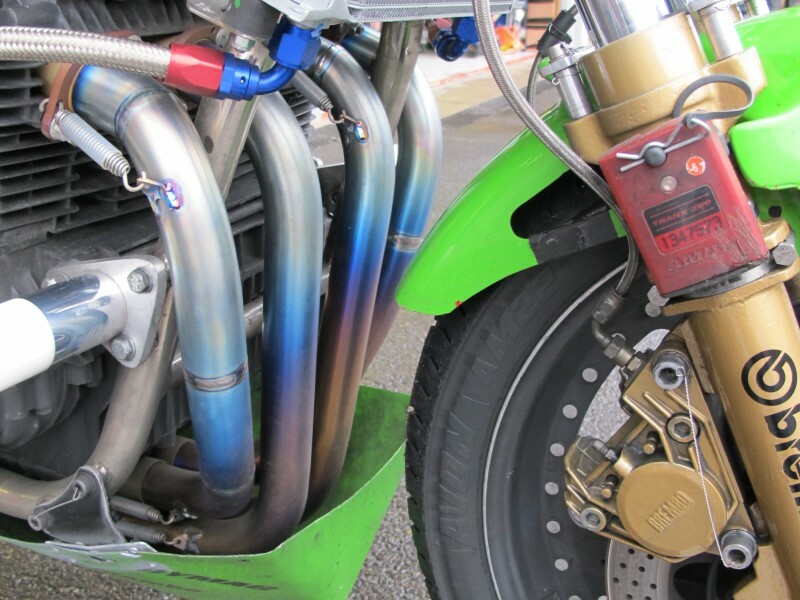 She is a special bike, as is his business “Rastec, which makes custom exhausts. He agreed to lend us his bike. 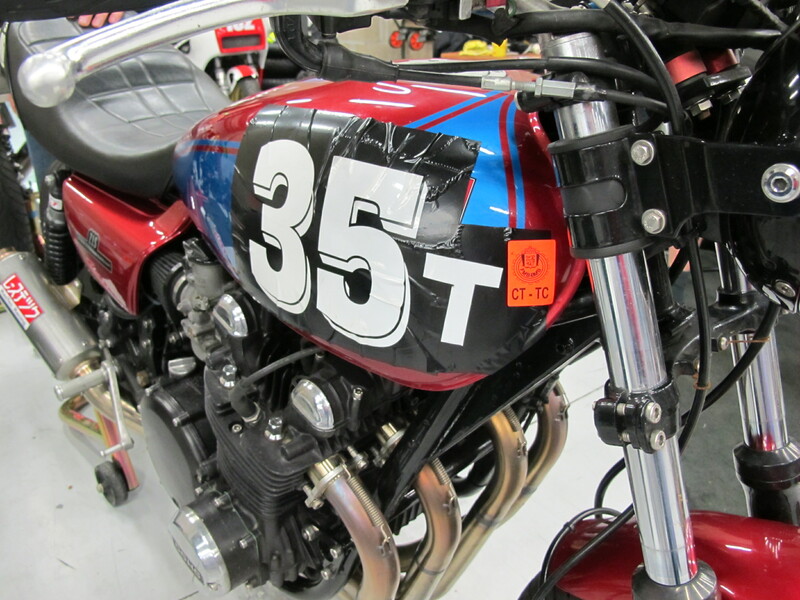 Quickly “Sandra” had “35T” race numbers slapped on, we taped up her license plate, and out we went. 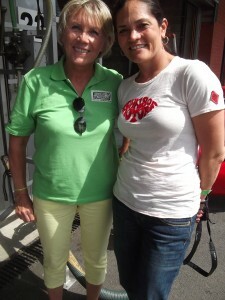 Luckily “Sandra” held up and both riders qualified, making the cut at 55th out of 80. But now what to do with our broken Suzuki? 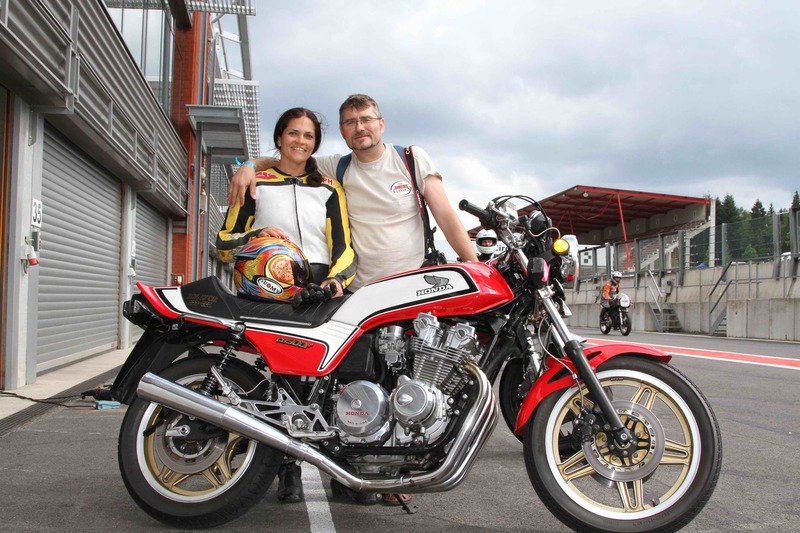 One generous team offered a spare engine, but the owner of the Z1s was so pleased, he offered to let us race the Bikers Classic 4-Hour with “Sandra”! 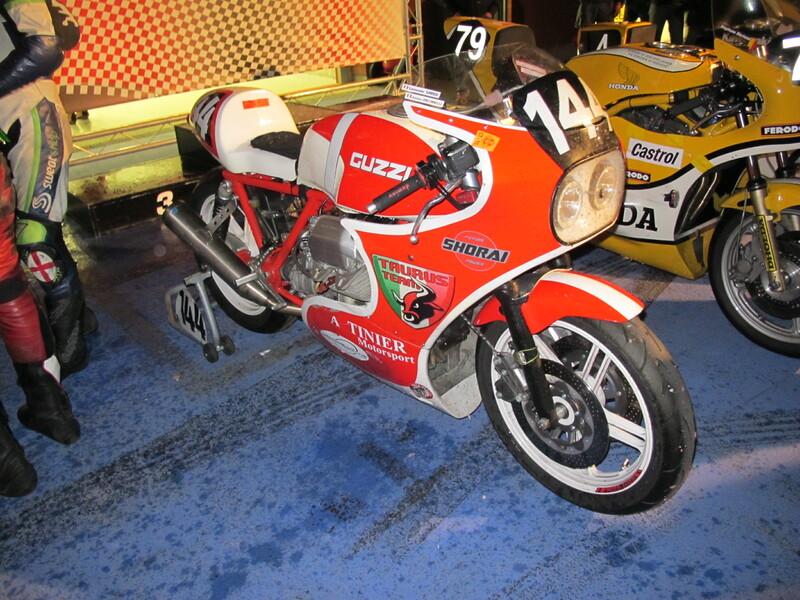 “Sandra “was the safest bet, as we were still unsure to what extent the Suzuki was damaged and the street bike would be a lot less work to modify. We had until 6pm the next day to get “Sandra” ready. Let’s Race “Sandra” – Early Saturday morning the tools came out and everyone set to work. Lights were installed and the special wiring harness that looked a little like a mad woman’s knitting. Next came the belly pan, chain guard, drill and safety wire nuts and bolts, swap tanks to allow for quick filler gas can, remove license plate, install special rear lights plate (each on a separate circuit), add steering dampener, and lastly a new set of race tires Conti Attack 2’s. 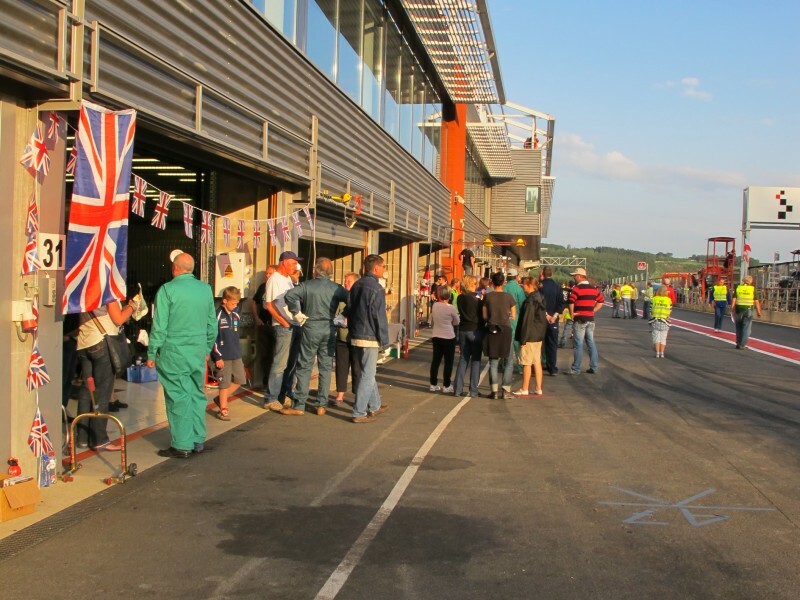 Return all borrowed stands and tools to gracious garage neighbors and bring a nice French speaking guy with you to meet with the racing scrutineers. After a bit of a discussion we were allowed to race “Sandra”. We had three hours to spare for a nap! 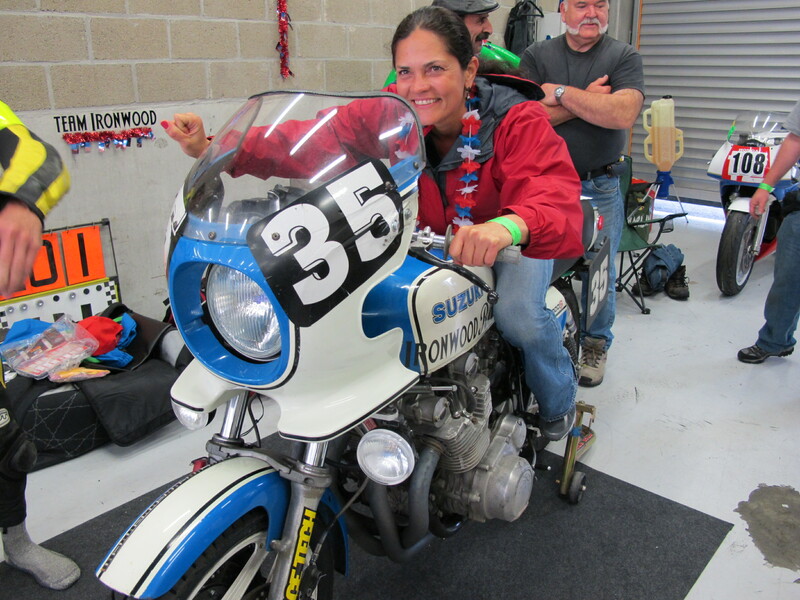 Wendy the Wrench – While pretending to be a mechanic and actually had a wrench in my hand, working on the race bike, the Motorrad Magazine “redakteur”, Thomas Schmieder stopped by with his photographer to check in and see how the American Team Ironwood was doing. I gave him the run down on what was transpiring and he asked how long have I been a mechanic? I smiled, and said “I’m not. 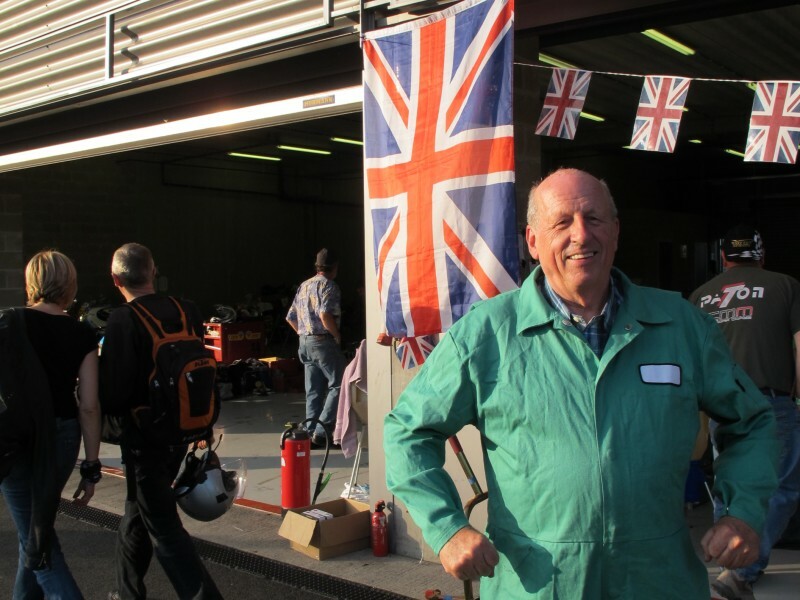 I’m an American vintage racer helping out.” Then his eyes widened with surprise. (I just love when that happens). 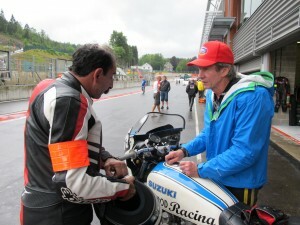 He quizzed me about what I raced so I told him many things. My teammates claimed that I was batting my eyelashes during this part…silly guys…women just blink faster. 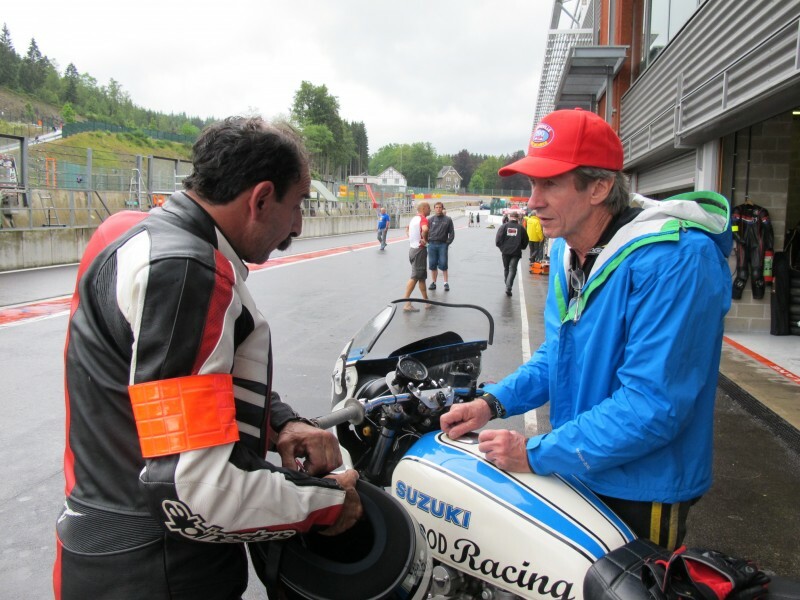 Mr. Schmieder learns that I had not yet ridden the Francorchamps SPA track and offered to let me ride his Honda CB900f street bike for a session the next day. I was thrilled and of course said yes! A dream come true…more on that later. 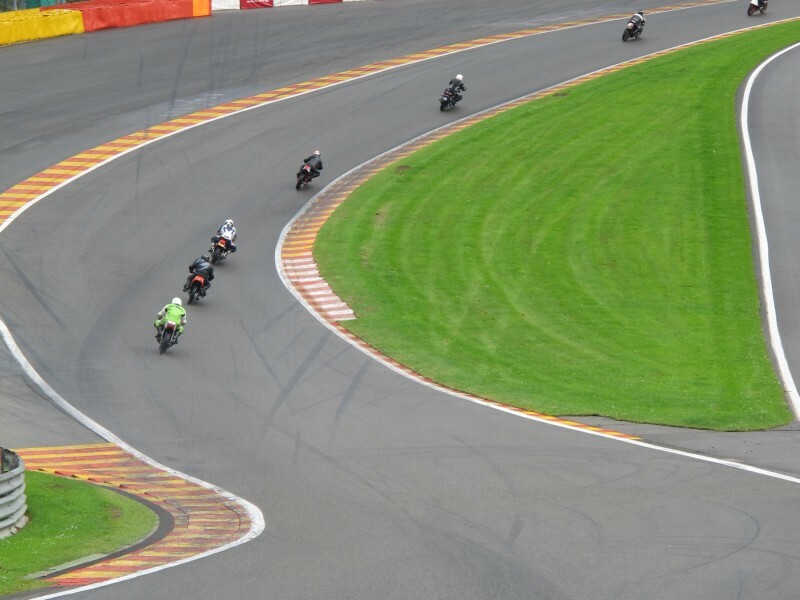 Pre-Race Buzz – The Bikers Classic pre-race practice started on time at 6pm, with race time at 8:30pm. Gary would race the first leg . 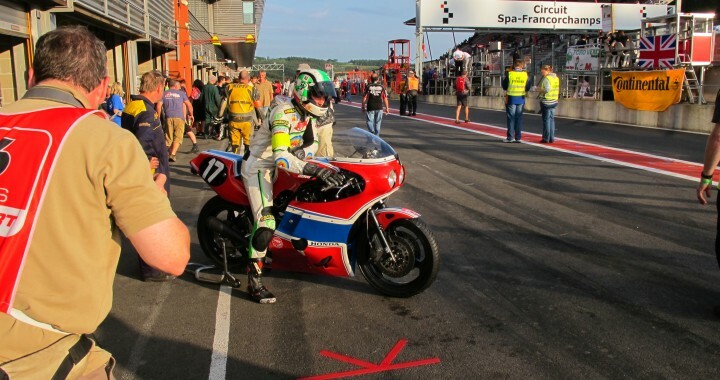 He did his Valentino Rossi ritual, a pre-ride squat and said a quick prayer next to the bike, then put on his race face and helmet and proceeded out to the grid. 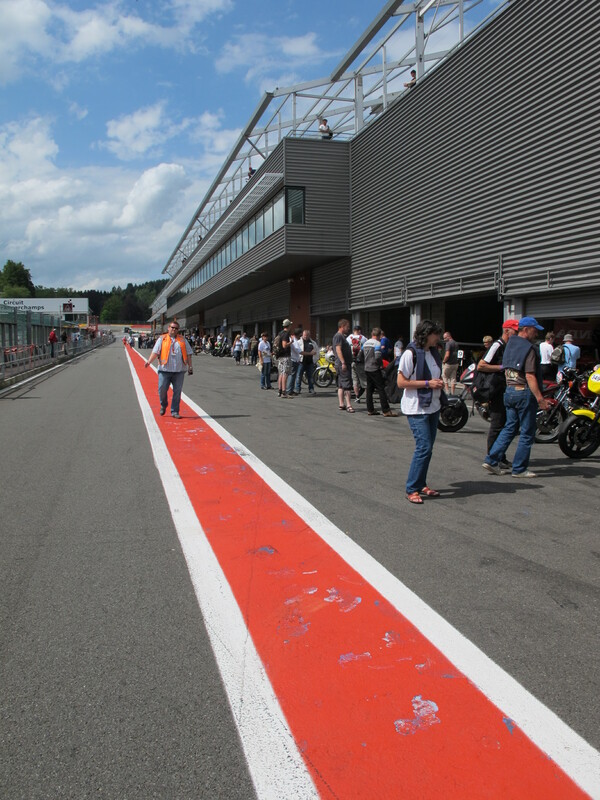 They had made a change to the Start/Finish location this year to be on the back straight, and somehow many riders missed an important part of meeting, which is done in several languages and takes a very long time. 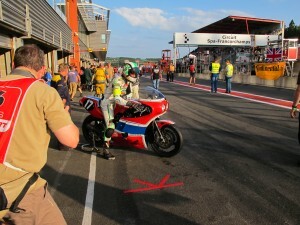 There was to be a practice LeMans style start, whereby the rider runs to bike from across the track, grabs it from the holder, starts it and then around for two laps, then a re-grid and the real start. Gary did not know this, nor did several others as it turns out later. Excited he took off in a blaze on the first start and couldn’t believe how many people he passed by the first turn, at least two dozen! Thrilled, he pushes faster passing people everywhere on the first lap! Then on lap two, suddenly a red flag comes out. The restart, and a buzz kill for Gary when he realized what was happening. 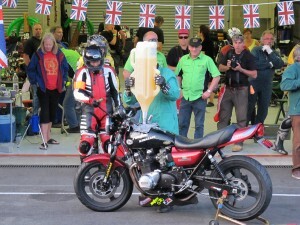 Race Time – Adrenaline flowing, Gary did well, and stayed out for a little over half an hour. Getting steadily faster with each lap and settling in the three-teens. He unexpectedly comes in indicating that the clutch was no longer disengaging with the hand lever. 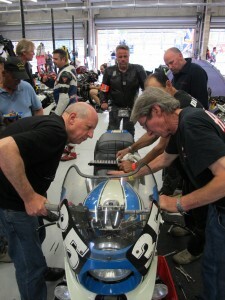 We adjust as best we could and push start the bike and race on. Gary comes in, Chris Mee refuels flawlessly, and out went Ralph with a five minute pit stop. Ralph was out for roughly 25 minutes, averaging three-teen’s. 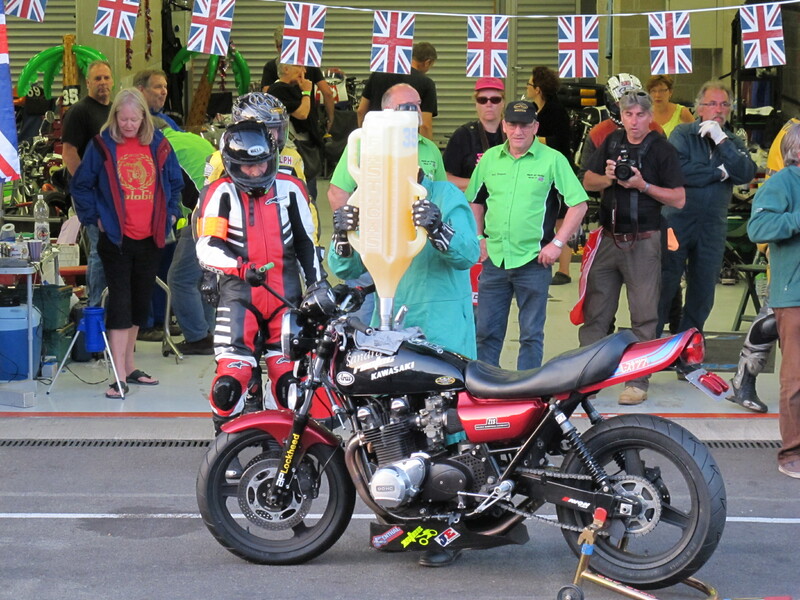 Each rider had a best time of 3:12, not bad considering it was a borrowed street bike, and their bests last year were a few seconds faster. However, once the sun had set, I lost sight of Ralph. It didn’t help that the bike was now a darker color and hard to see without all the trick LED side lights that had been on the white and blue Suzuki. Worried, I did not see him go by after three laps I knew that was because he wasn’t. Ninety minutes into the race the bike broke, same as last year! 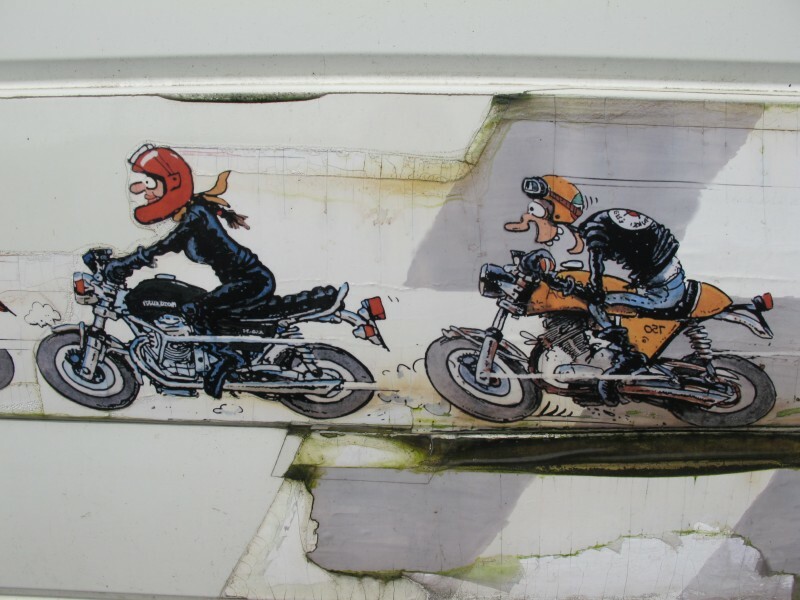 Trouble at Night – Sure enough after we waited for about 20 minutes, the mood sullen, Ralph came in pushing the bike. The generator had broke shortly after the lights had been turned on. No lights means no racing. We also learn the clutch pack nut had backed out and became loose, which explained the earlier clutch problem. Ralph had sat on track in the cold and dark, corner workers are not allowed to assist. He then pushed the bike up a hill and bumped started it, out of the way of the other riders. Luckily it started and got him to the pits. Another year, another “break” and agonizing defeat. Team Ironwood=0, Bikers Classic SPA=2. Team Taurus Guzzi Third! 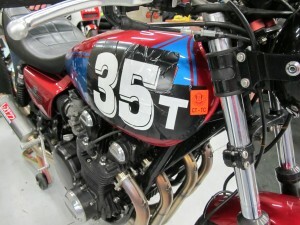 – We learn “three” appears to be the magic number for the Bikers Classic 4-Hour endurance race teams. As we spoke to several teams, all of which were veterans, sharing that their bikes also broke the first two times they attempted the race. 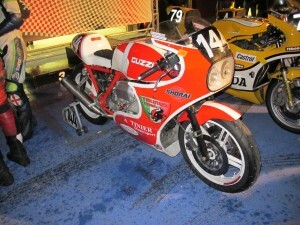 American Team Guzzi Nerd finished, but not the first Guzzi like last year. American Team Mojo did not finish. 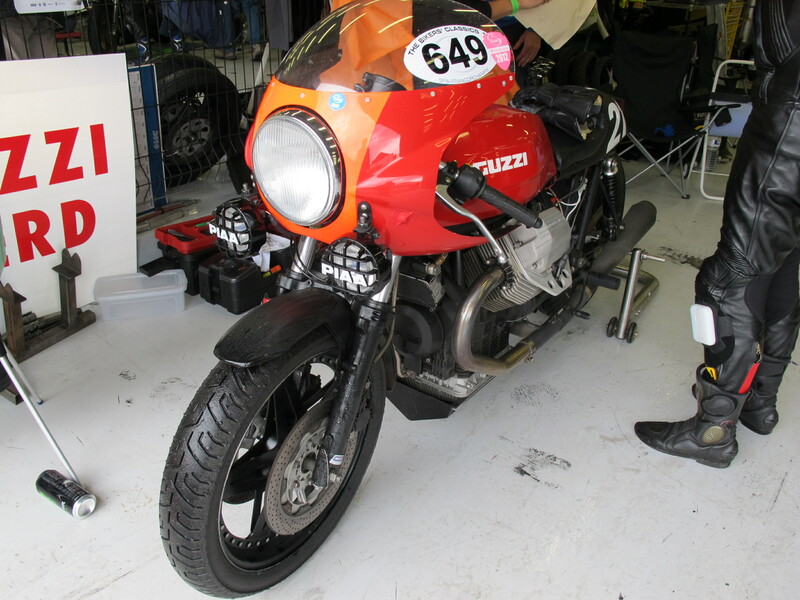 However, our garage neighbors, Team Taurus Guzzi, sponsored by Altinier Motorsports came in third overall. It was fun to witness and congratulate the team of elated Italians jumping up and down drenching each other in showers of champagne, cheering crazily in Italian. 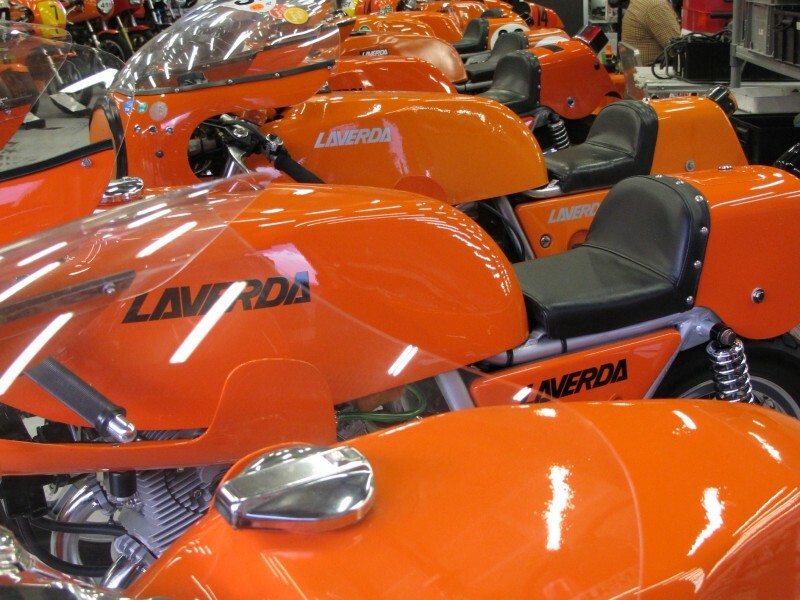 I had spoken to Allesandro Altinier, the day before having bought a bike from him earlier in the year at an auction. Asking why he chose to race a MotoGuzzi? 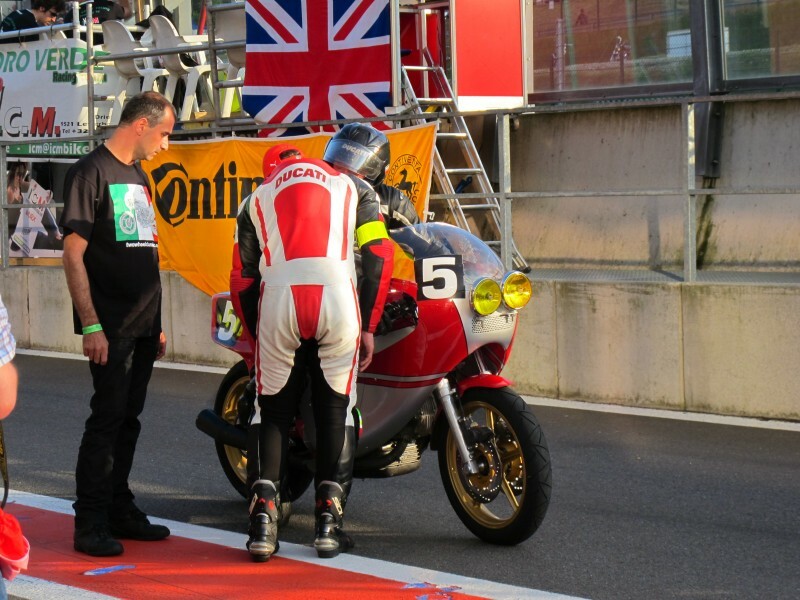 His answer…first there are too many Japanese bikes racing endurance…second, it is not easy to make a Moto Guzzi last a four hour race and so it says a lot about your teams ability…third, and most importantly, it is Italian! Can you guess his nationality? He said that his team did not finish last year so this was an excellent and important outcome for their team. They are use to winning in their home country’s Italian Series. They decided to race the Bikers Classic Endurance series this year because the Italian series has been in crisis due to the economy. 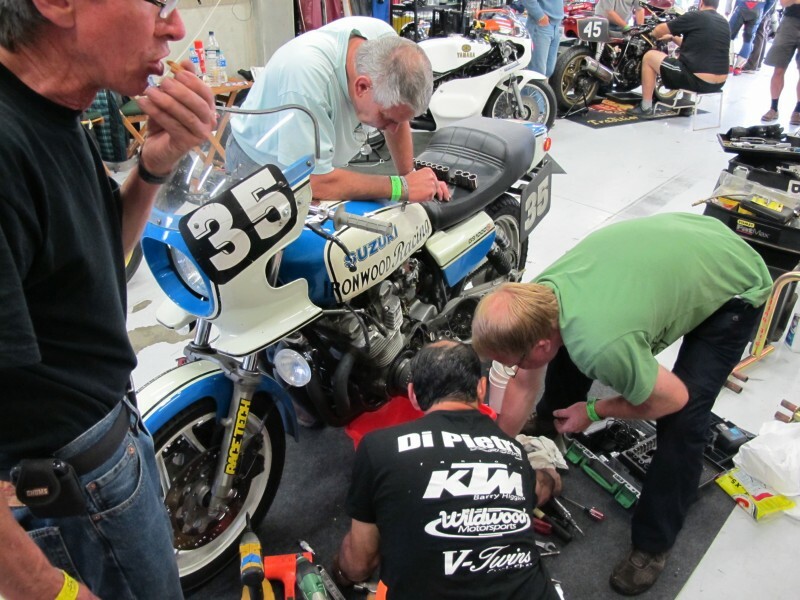 Adding it is critical to win races and maintain a presence in racing, for his business is restoring and selling vintage race bikes. 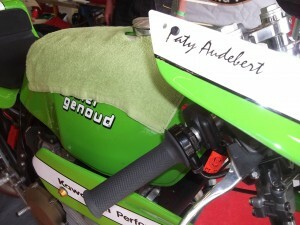 Patricia Audebert my hero. 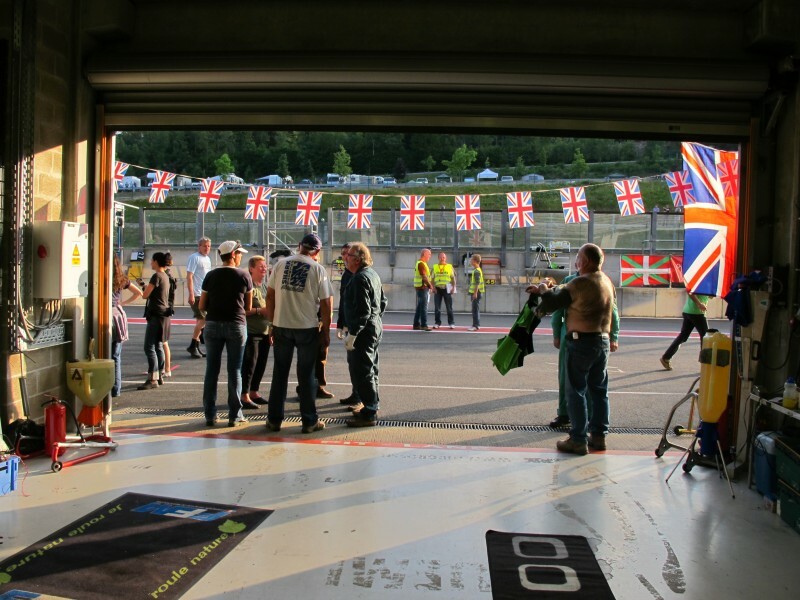 – I walk the garages after the race and celebrate with other teams, well into the early morning hours. One team I had a particular interest in learning the race outcome, was from the Netherlands and one of the pilots was Patricia Audebert. She didn’t speak any English, but I was cheering for her as she was my inspiration and my hero. 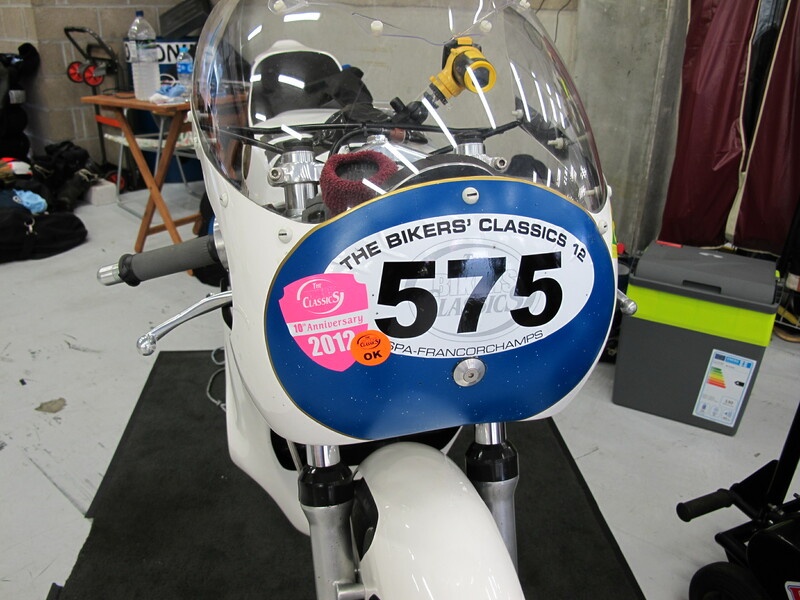 It was her first endurance race and she was older than me, meaning I might be able to attempt the Bikers Classic. Her team not only finished but did pretty well on a Kawasaki. 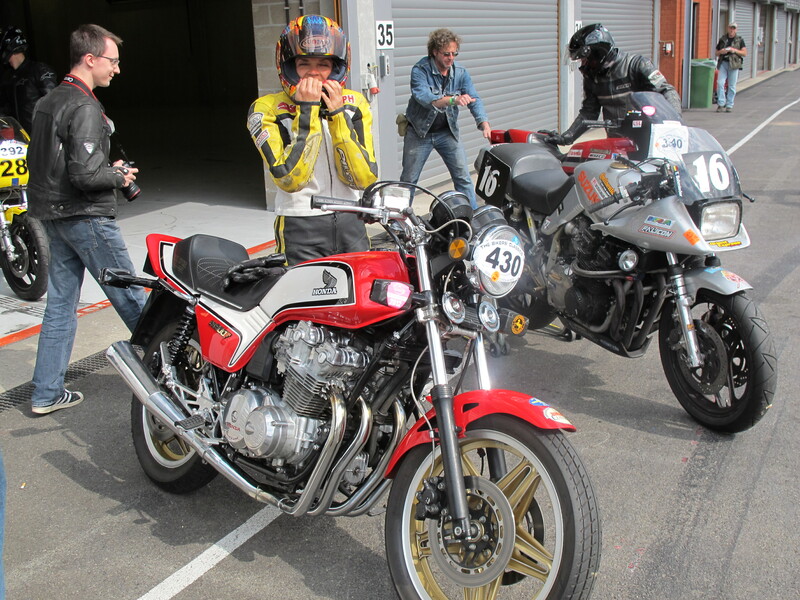 We also visited the Motorrad garage and I met the Honda CB900f I was to ride within hours. The Bikers Classic organizer granted the official okay for me to ride the track. So after only four hours sleep, I borrowed Ralph’s leathers and hopped on the bike. I was excited and nervous. – It felt like I was riding a worn comfy couch…blind. I had not done my homework with regard to the track layout and had very little idea of what to expect from a two wheel view. I took it really easy, and learned quickly where every bump was on the track. This was because it took 200 yards for the poor old tired Honda’s suspension to settle afterwards. 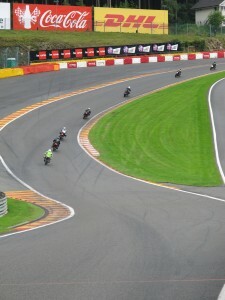 Especially down the straight to the famous turn, the “Eau Rouge”. But alas, I was riding SPA! After a couple of laps I quickly learned the limits of the bike. There was only one place of concern, the hairpin. It was hard to ignore the many wide sawdust lines leftover from the action the night before going every which way and on the race line. I quickly remembered the guys concern the night before stating there were at least six racers down due to oil on the track, all in the same place. I tried to imagine what it would be like to race in the dark and in the wet! 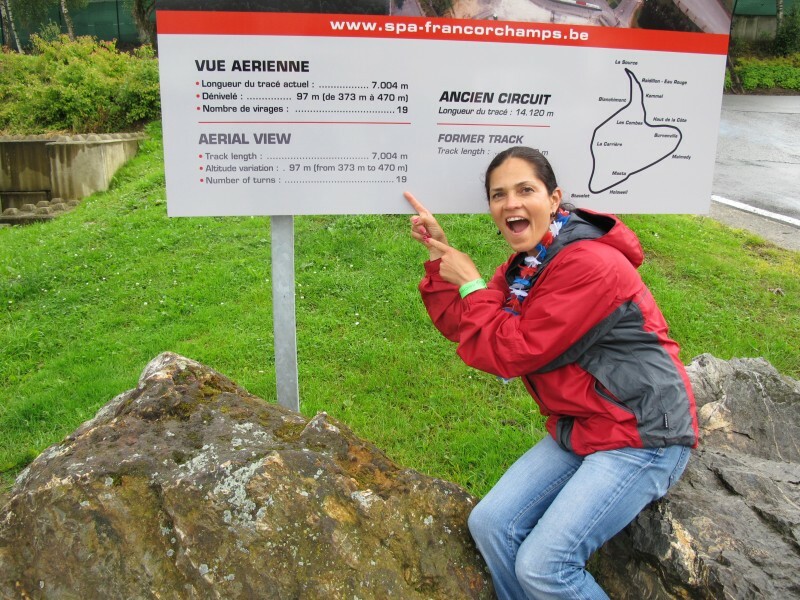 Most of SPA is ….F-A-S-T! It is also very well maintained and sssmoooth. A love for fast tracks, I had never been on such a big wide fast track the likes this. Francorchamps SPA made my home track, Willow Springs, the fastest track west of the Mississippi seem like a third rate kiddie kart track. I could see now how F1 cars could do sub-two minutes! Crazy! High as a kite I pit in. It must be what heroin feels like! I wanted more…and bad! I thanked Thomas profusely for trusting me, a stranger, with his bike and the opportunity. Giving back Ralph his leathers, only to be told shortly after that if I could get ready in five minutes I could go out for the very last session. I did! This session was longer and my confidence grew, I started feeling racy, making passes on people. 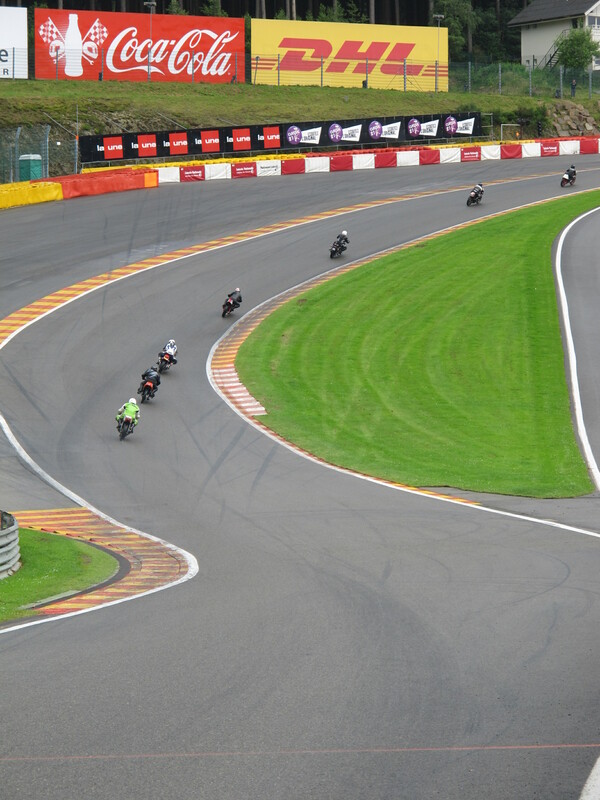 My goal was to see if I could fly up Eau Rouge without backing off, which is what you want to do as the front end gets light on the uphill turn. 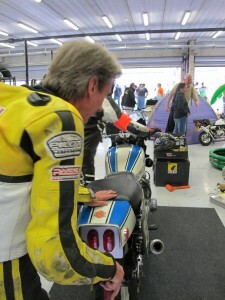 Thomas rode with me that session on his Katana race bike, first following me around, then passing and we ride together. I couldn’t ride very hard, it just simply wasn’t a race bike, and it was tapped out in the fast places and wallowing badly. 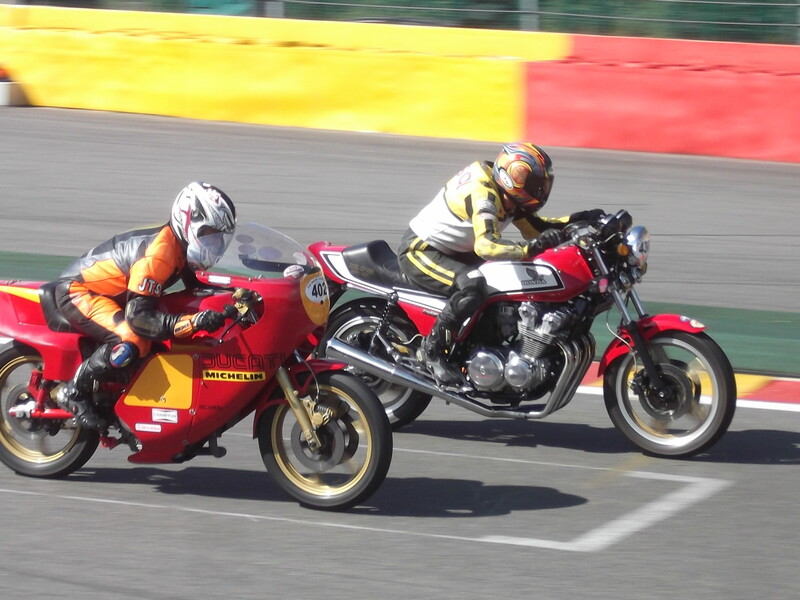 But I was able to surprise myself and him when we both blew down the straight passing people and flew up and around Eau Rouge. He turned to check on me and I was right there. Surprised he signaled a thumbs up sign and I beamed proudly with a face-cracking grin. Sadly it was our last lap. That experience is now permanently etched in my memory, and helped me decide whether I could race SPA. Perhaps a fool’s false sense of confidence, however, I am sure of this, Ralph will have to find a new lap timer for the Bikers Classic. It would be torture to sit track side at SPA again. 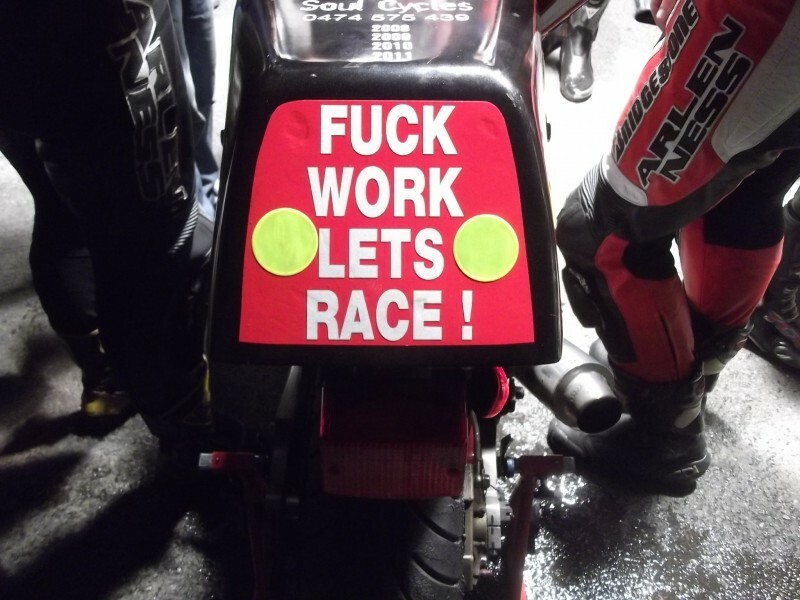 Damn this racing addiction, just when you think it can’t get any better … it does!